Potatoes can take a while to cook so I like to batch bake several potatoes individually wrapped in tin aluminum foil and keep them in the fridge for work and family for a few days. Any kind of potato will do – yellow, red, purple, orange, gold and white can be utilized as part of a delicious meal. Need a quick idea? You can top baked potatoes with spicy kidney beans, low-fat cheese, chives and plain Greek yogurt or low-fat sour cream. Another great way to use potatoes is to shred baked potatoes and cook into hash browns then serve with veggies and scrambled eggs. 1/3 Bag of mixed greens – green leaf lettuce, frisée, radicchio and carrots. Wrap potato in tin foil and heat in the toaster oven for about 30 minutes before lunch. If you just don’t have access to a toaster oven, slice potato and heat on skillet with a teaspoon of oil and tablespoon of water, flipping intermittently. Rinse lettuce, drain, pat dry and plate. Chop apple leaving the skin on. 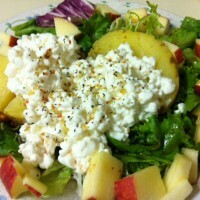 Put baked potato, lettuce, and apple on a plate and top mixture with cottage cheese, herb blend and salad dressing on mixed greens.